Someone asked me the other day if the biography I’m working on will contain any fictional elements. If it did it, wouldn’t it be a work of historical fiction, and not a biography? And yet, I do confess, the temptation to create fiction – to fill in the gaps – is strong. Occasionally within the text of my manuscript I offer some brief conjecture. But I’m careful to make it very clear that conjecture and guess-work (albeit educated guess-work) is all that it is. However sometimes my conjecture is nothing but a gut feeling, a complete flight of fancy: in effect it is fiction and so has no place in my manuscript. Might it find a place here, instead? Elizabeth Macarthur‘s father Richard Veale died when she was six. Her mother Grace, only 25 when she was widowed, subsequently married a Cornish farmer named Edmund Leach. His farm was much smaller than the one Elizabeth’s father had (so, in effect, Grace remarried down). The only Leach I can find would have been aged 62 at the time of this marriage. Elizabeth was twelve years old when her mother remarried. Elizabeth’s mother and Leach had a daughter, called Isabella. Leach died when Isabella was aged two and Elizabeth was sixteen. A villager, many years later, recalled to a Macarthur descendent that Elizabeth may have lived with her maternal Grandfather. Elizabeth later claimed to have been virtually adopted by the local vicar’s family. Elizabeth married in 1788, had a baby five months later and arrived in NSW in 1790 (aged twenty-three). Several years after Elizabeth had departed for New South Wales her mother married for the third and final time, to John Bond. Bond was known to Elizabeth – indeed he was a witness at her wedding to John Macarthur – and Elizabeth was not pleased with the match, considering it “a misalliance”. Bond and Elizabeth’s mother lived on together into old age. Elizabeth, when in her sixties, confessed she knew nothing of her half-sister’s marriage or life. They had exchanged no letters since Elizabeth’s departure. She didn’t even know her brother-in-law’s name. Elizabeth did know enough, though, to be aware that her sister’s family was not well-off. Elizabeth’s half-sister Isabella had, or was given, a bible. When in later life Isabella emigrated to Canada’s Prince Edward Island with her husband and children, she took her bible with her. Her descendents there have it still and, over the years, have recorded generations of births and deaths on its blank pages. One of the inscriptions in the bible is a copy of a newspaper article, transcribed by hand into the bible, presumably by Isabella. 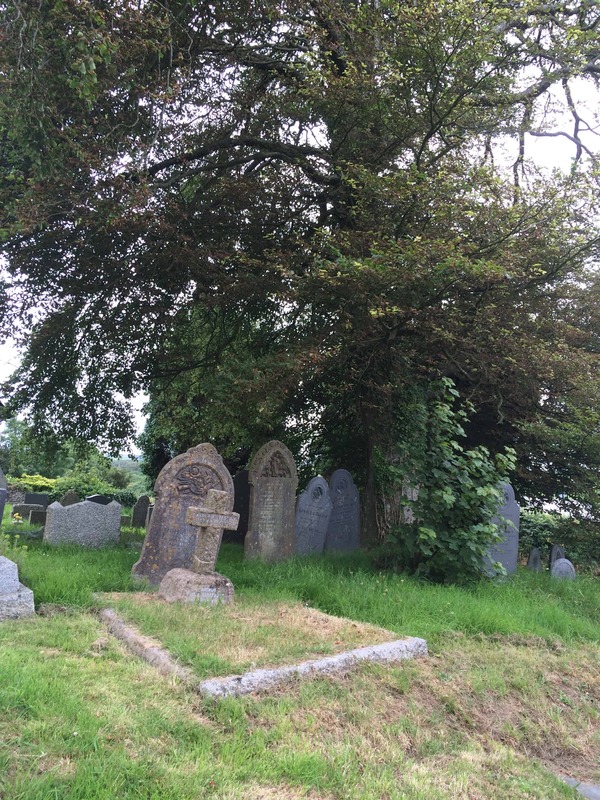 The article records the death and burial of her mother, aged 89; left behind by both her daughters in Bridgerule, England. Another of the inscriptions in the bible is this: Sacred to the memory of John Bond. The same words are on Bond’s gravestone, a stone which also commemorates Elizabeth and Isabella’s mother, Grace. Grace’s first husband, Elizabeth Macarthur’s father, is buried in the same churchyard. His stone is still there too. Elizabeth and her mother had a rocky relationship. Which teenage girl welcomes a stepfather and a new baby? Which 18th century mother with aspirations of gentility doesn’t take her daughter to task for falling pregnant before the wedding? My so-called evidence? None of Elizabeth’s daughters were named Grace. Elizabeth was dutiful towards her half-sister but there was no love lost there. The opposite may not have been the case: Isabella’s first daughter was called Elizabeth Veal Hacker. Edmund Leach was a bad egg. Evidence? No mention of him in his daughter’s bible at all, although her step-father John Bond rates a mention. In reality, I know nothing of Leach as a man, or as a father, but I have a bad feeling about him. I have no evidence for my bad feeling, no anecdotes, nothing I could include in a biography. Just this trail of telling silences. Was he mean? Violent? A drunkard? Who knows – maybe he was perfectly nice and gave generously to the poor. Perhaps it is into these silences that biographers are prone to project their own fears, or their hopes for a more interesting tale. But it is these gaps that keep us going, keep us researching, keep us writing. The gaps are where the mysteries lie.